Lincoln, Rhode Island- CES MMA we are live and in place on press row at the Twin River Casino Event Center ahead of the opening bell here at CES 54. Fights start at 1:50pm est sharp with the Main Card starting at 3pm est and will be aired live on UFC Fight Pass. Fighters and fans follow along with this article throughout the afternoon for live up to the round coverage of CES 54, share this release on social media for out of town fans who cannot make it to the show! Round 1: Here WE go! Pinheiro comes out swinging and Aubrey slips Aubrey returns to his feet and takes Gil down and works some ground and pound from the top. Pinhiero uses his wizzer to return to his feet and Aubrey presses him against the cage, Pinheiro connects with an elbow that cuts Aubrey and gains space for Gil. Pinheiro is coming forward throwing gas and Aubrey throws a combo of his own and its now Aubrey with his back to the fence. Aubrey glances Pinheiro with a flying knee from the cage Aubrey circles and takes Pinheiro down and looks to take the back. Pinheiro once again gets on his feet and they are exchanging again. Aubrey finishes the round by pressing Pinheiro against the cage. Close round 10-9 Aubrey very close! Round 2: Aubrey comes out and takes Gil down quick and is landing some heavy hammerfists but Pinheiro pulls him in close to avoid further damage. Gil looks to get out with the butterfly guard but Aubrey returns to guard and continues to work with elbows and hammerfists. Gil gives his back and stands up as both fighters are bloodied up good. Aubrey takes Gil down once again and Pinheiro gives his back again as Aubrey looks to sink his hooks in. Aubrey looks to harvest the neck of Pinheiro and with little work and all the blood the Rear Naked Choke sinks in deep and Aubrey gets the tap. Decision: Eugene Aubrey defeats Gil Pinheiro by submission (Rear Naked Choke) at 3:28 of the second round! Round 1: Both fighters come out looking to find their distance and Monroe gets a finger into the eye of Baxter and the doctor is having a look. Baxter passes inspection and we are back to the action. Baxter starts with a leg kick and Baxter shoots for a take down and it is stuffed. Both fighters are trading and Baxter shoots in for the takedown once again. The fence stops the takedown and Baxter has Monroe pressed against the fence. Monroe turns the action as Baxter tries to strike his way out. Referee John English breaks the action and we return to the center where Baxter lands the first combination ending with a high kick that gets the attention of the crowd. Baxter lands come more leather and follows with some kicks as he has Monroe on his back leg. Baxter presses Monroe on the cage once again but Monroe turns the action again. Baxter turns the action once more and lands some dirty boxing as the round ends. 10-9 Baxter. Round 2: Baxter comes out with low kicks to start round 2 and follows with an overhand right, Monroe looks for a kick of his own but Baxter catches it and puts Monroe on the fence. They go back and forth on the fence and Monroe gets Baxter to the ground. Baxter eats a shot on the way up but immediately shoots for another takedown and they are back on the cage wall. We get back to striking distance and Baxter lands but is returned by a Monroe hook that hurts Baxter and puts him on the ground. Baxter survives and returns to the feet where he looks to establish his jab. Baxter is poked in the eye once again. Referee John English takes a point from Monroe and the fight resumes. Baxter once again looks to establish the jab as round 2 ends. 9-9 with the point taken from Monroe. Round 3: Baxter comes out throwing and landing some leg kicks and Monroe returns fire as they trade early in the third. Baxter puts Monroe back on the cage and once again Monroe turns the action. Baxter is landing shot shots with his back to the fence before English breaks the action again and fighters return to striking distance. Baxter lands a kick up the middle as he continues to try and back Monroe up. Baxter puts together a flurry of punches that close the distance as he shoots for another takedown and is stuffed once again. Baxter goes for a hip toss but slips to his back and Monroe gets on top with 20 seconds left in the round and that's where the fight ends. 10-9 Baxter. Decision: William Knight defeats Kevin Haley by tap due to strikes. Round 1: Kylie comes out throwing looking to finish this thing quick, Miele wraps her up and puts her on the cage, Kylie escapes and it throwing for the fences. Miele wraps her up and trips Kylie to the mat where she looks to work from the top, Kylie gets to guard as she looks to throw leather from the bottom and Jessy looks to pass the guard. Kylie looks to isolate the left arm of Miele and Jessy picks her up and slams her but Kylie doesn't let go and pulls Miele in close. Kylie is bleeding heavily from the right eye as she continues to get pressured by Miele's top game. Miele lands another elbow from the top as the round ends. 10-9 Miele. Round 2: O'Hearn comes out with an overhand right that lands flush and follows it with some more heat as Miele looks to tie up and takes Kylie back to the mat. Miele gets to half guard and lands some right hands as Kylie looks to escape. Miele looks for a keylock on the opposite arm but Kylie defends and gains her guard back. Kylie threatens an armbar and looks to escape out the backdoor, O'Hearn makes it back to the feet and looks to take Miele's back from the standing position Kylie gets the back and Miele goes down but is able to turn in the guard of O'Hearn and once again ends up on top in Kylie's guard. Miele finishes the round on top in the guard of O'Hearn. 10-9 Miele. Round 3: Kylie comes out like she did the first two rounds throwing for the fences, Miele clinches and Kylie lands some knees and now takes Jessy down and has top control for the first time in this fight. Kylie has Jessy in a head and arm and Miele looks to escape to the back. Kylie throws up guard to avoid the back take and Miele mounts O'Hearn and looks to work on that bloody right eye. Miele is using short hammerfists to land more damage to O'Hearn, John English is taking a close looks as he instructs Kylie to improve her position but Kylie continues to fight. Jessy finally postures up fully from the mount and lands some ground and pound for the stoppage. Decision: Jessy Miele defeats Kylie O'Hearn by TKO at 4:27 of the third round. Round 2: Matsuda come out in round two and looks to showcase some striking but it's short lived as Ricci takes him down. Matsuda looks to return to his feet and Ricci goes for broke on a double leg that leaves Matsuda in top control. Matsuda continues to work but its not enough for referee Kevin Mulhall as he stands the action up. Tateki once again looks to strike with Ricci and Ricci looks for another takedown. Tech pulls guillotine as the round ends. 10-9 Matsuda. Round 3: Matsuda starts round three with a body kick and Ricci follows with an overhand that sits Matsuda down. Tateki returns to his feet and backs Ricci across the cage and takes him down now. Ricci's stay on the ground is short lived as they stand as they clinch on the fence and Ricci secures another takedown. Matsuda scrambles as Ricci grabs the front choke and attempts to turn it into another takedown which is stuffed by Matsuda. Matsuda pushes Ricci's head to the mat and ends up in half guard. Ricci gets up but not before taking a knee to the body. Ricci lands a combination to the head and body and Tateki looks for a double leg that is stuffed by Ricci. Ricci looks for a takedown of his own and gets it on the fence, Tateki stands back up and drops Ricci as the fight comes to an end. 10-9 Matsuda....VERY CLOSE ROUND could go either way. Round 1: Pla comes out and lands a left to thed body to get things going, Eric closes the distane and puts Pla's back to the fence and ties him up. Spicely slings Pla to the mat and mounts him looking to end this one quick, Spicely has world class Jiu Jitsu and from the top this fight doesn't look long for Pla. Spicely lands some elbows from the top to soften Leo up and now some more heavy hammerfists from the UFC veteran, Spicely takes a tour to side control before returning to mount and landing the finishing touches that get the stoppage from Referee John English. Decision: Eric Spicely defeats Leo Pla by TKO at 3:53 of the first round. Round 2: Gravely comes out with a lower leg kick and Moutinho looks to fire some shots but leave the mid section open and Gravely takes him down. Kris tries to escape to his feet but the Champion grabs a front choke and keeps Moutinho on the ground where he ends up in half guard. Once again Kris looks for the shoulder lock to no avail as Gravely looks to mount. Kris defends the mount attempt and ends up back in guard as Gravely continues pressure from the top. Moutinho uses a wizzer to get to his feet but its short lived as the Champ plants him on the mat again. Moutinho lands some elbows to the Champ as the Champion look to bring his all the way down to the mat but Moutinho works and stands as the round ends. 10-9 Gravely. Round 3: Gravely comes out and grabs Moutinho around the waist and slams him to the ground, Moutinho once again looks for the keylock as Gravely passes the guard and gets to side control. Gravely attempts the mount again but Kris defense as he continues to work hard from the bottom. MOutinho works his way the fince in effort to get back to his feet but Gravely is heavy on top, Moutinho gets a hip under himself but Tony takes it right away and they go back to the ground and Gravely looks for the d'arce choke and Moutinho escapes as they fight against the cage and the round ends. 10-9 Gravely. Round 4: Both men come out throwing solid leather to open up the Championship rounds, with Gravely landing the heavy shots Moutinho ties up the champion and looks for a takedown but Gravely stuffs and pushes Moutinho's back to the cage where he looks for a takedown of his own. Moutinho goes back to the keylock as Gravely has him pressed against the fence and eventually works to half guard. Gravely works to side control once again but Moutinho stands and lands a combo over the top of another double leg takedown by the Champion. Gravely postures up and lands some ground and pound as Moutinho looks for a leg lock yet again. as Moutinho looks to sink the leg lock Gravely connects with some heavy hammerfists, Moutinho survives the first two hammers but the third knocks Kris out cold. Decision: Tony Gravely defeats Kris Moutinho by Knockout at 4:02 of the fourth round. Tony Gravely retains the CES Bantamweight World Title in a tough fought battle by both fighters! Round 1: The southpaw Andrews starts off with a kick and Logan follows with a combination, Andrews fires back and connects with the cup of Logan and referee John English stops the action while Bryce recovers. And the action resumes with Logan throwing first but he misses his target. Nate throws the jab out there and follows with a left hook, Andrews connects again with the left hook and Logan answers with a combination of his own and he clinches with Andrews against the cage. Logan lands some body shots but Nate is starting to put together some combinations that get Logan's attention and Logan shoots in and takes the champ down and pops into side control. Nate works back to guard and grabs Logan's arm and looks for the Armbar as the first round ends. Close round, very close 10-9 Andrews. Round 2: Both men come out with jabs and Nate follows his with a push kick to the midsection of Logan. Nate looks the much fresher fighter as we start the second round and now Logan lands to the cup of the Snake. Nate recovers and we start back up with Nate backing Logan down with punches, a left hand crumbles Logan to the mat, Logan tries to grab Andrews leg to recover but Nate lands some hammerfists and Logan covers up and Andrews sinks in a deep guillotine got the tap. 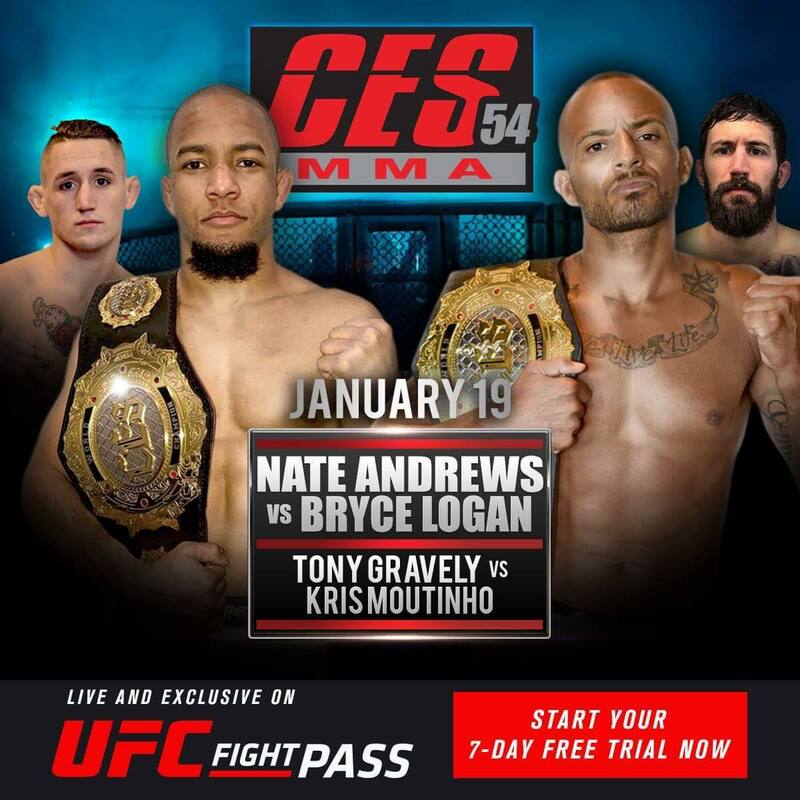 Decision: Nate Andrews defeats Bryce Logan by Submission (Guillotine) at 1:42 of Round number two to retain the CES Lightweight World title and run his record to an overwhelming 15-1 as he calls to Dana White for his UFC contract in his post fight interview. Due to the impending weather and a 100 mile journey home we are packing up our things and heading home from Twin River. Due to contractual obligations two of the preliminary fights will now take place following that main event. I will do my best to relay to you guys the outcomes of the final two fights. Decision: Yorgan de Castro defeats Carlton Little by Unanimous decision.